A skull is always smiling. While people all over the world recognize the skull as a sign of death (when else do you see one? ), not everyone shrinks away from the sight. A celebration known as Dia de los Muertos—the Day of the Dead—actually looks to the human skeleton as a symbol of the people who came before us. CRACK A SMILE: The Guadalupe-Nipomo Dunes Center is currently showcasing some Dia de los Muertos-inspired works by Los Angeles-based artist David Lozeau. These deathly depictions aren’t clad in long black robes and carrying scythes, but rather don the festive outfits of parties and weddings. The Day of the Dead’s origins are firmly rooted in Hispanic and Central American traditions, dating back to the ancient indigenous Aztecs. The Catholic Church later adopted the celebration into a Christian context, and it’s since grown from a regionalized cultural happening into a holiday that’s gaining popularity in the United States, where people are embracing the tradition of building altars, preparing food, playing music, and eating sugar skulls. A variety of local groups are organizing Dia de los Muertos events throughout the Central Coast this year, with many celebrating on Nov. 1 and 2 via a variety of visual and performing arts. 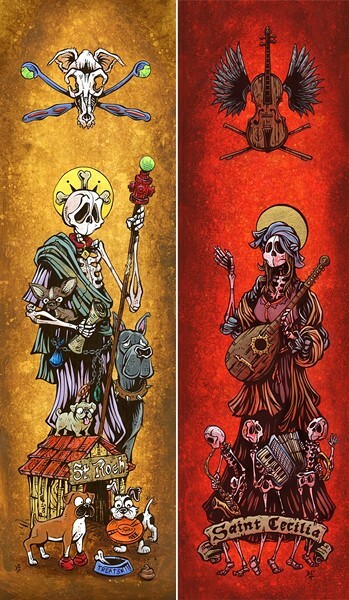 The Guadalupe-Nipomo Dunes Center is, instead of a mounting two-day event, playing host to an exhibition of visual works created by San Diego-based artist David Lozeau, whose style is hugely influenced by Dia de los Muertos, as most of the subjects he paints are skeletons. CELEBRATE THE DEPARTED: Wilshire Hospice and the San Luis Obispo Museum of Art present a Dia de los Muertos event on Nov. 1 from 10 a.m. to 3 p.m. at Mission Plaza in SLO. More info: sloma.org. • The Dana Adobe Nipomo Amigos present a Dia de los Muertos event on Nov. 1 at 1 p.m. at the Rancho Nipomo Dana Adobe, 671 S. Oakglen Ave., Nipomo. Free. More info: 929-5679 or danaadobe.org. • The Guadalupe-Nipomo Dunes Center presents a “Day of the Dead” exhibit featuring the work of David Lozeau showing through Nov. 16 at the center, 1055 Guadalupe St., Guadalupe. More info: 343-2455 or info@dunescenter.org. • The Mexican-American Scholarship Cultural and Recreation Association (MASCARA) presents a Dia de los Muertos celebration and exhibition showing through Nov. 3 at the Santa Maria Town Center, 142 Town Center East, Santa Maria. More info: 720-3139. • The city of Santa Maria presents a Dia de los Muertos event on Nov. 2 from noon to 5 p.m. at the Veterans’ Memorial Community Center, 313 W. Tunnell St., Santa Maria. More info: 925-0951, Ext. 260, or cityofsantamaria.org. • The Santa Maria Valley Discovery Museum holds a “Passport Thursday” event with a program about Dia de los Muertos on Oct. 30 from 11 a.m. to noon at the museum, 705 S. McClelland, Santa Maria. More info: 928-8414. Lozeau’s Day of the Dead-inspired art will show at the Dunes Center through Nov. 16, revealing his cartoonish depictions and more serious and realistic-looking paintings alike. He’s come to see his art pieces as altars that immortalize a time, place, idea, or person. This falls completely in line with the traditions of Dia de los Muertos, which includes altar building at cemeteries, at special events, and in homes. 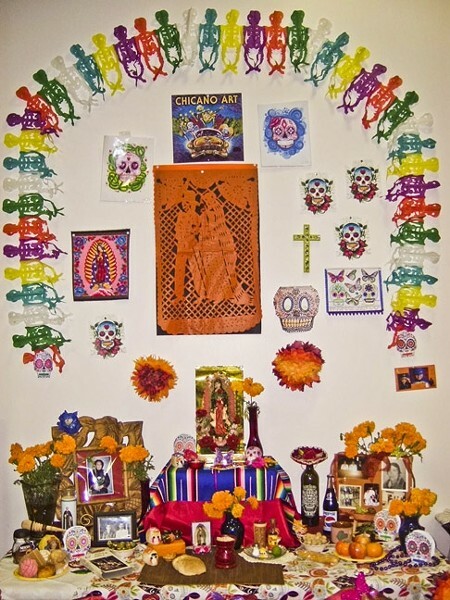 The altars—known as ofrendas, usually made by family members and friends—immortalize departed loved ones with photographs, bright artwork, tokens, figurines, and even food. All the items serve to help the living remember and honor whomever the altar was built for, explained Gina Rodriguez, president of the Mexican-American Scholarship Cultural and Recreation Association (MASCARA). MASCARA is presenting its 20th annual Day of the Dead celebration and exhibition at the Santa Maria Town Center. The event is held through Nov. 2 and includes several different kinds of ofrendas. Some of the altars are put up by families or individuals, but there’s also a community altar, Rodriguez explained, to which everyone can contribute. This year, MASCARA is honoring people who have died as a result of violence, Rodriguez explained, in order to both raise awareness of the problem and honor those who’ve been recently lost to gun violence, domestic abuse, homicide, and suicide, all of which are issues that have affected local families. Others find Dia de los Muertos to be a celebration worth having not because of any particular ancestral heritage, but rather due to the nature of the tradition itself and the way it addresses death. Wilshire Hospice in San Luis Obispo has partnered with the San Luis Obispo Museum of Art and the Mission San Luis Obispo de Tolosa to present a Dia de Los Muertos event in Mission Plaza in downtown SLO on Nov. 1. The event is more than just fun; it’s valuable on many levels for people grieving the loss of a loved one, explained Wilshire Hospice bereavement manager Ingrid Pires. 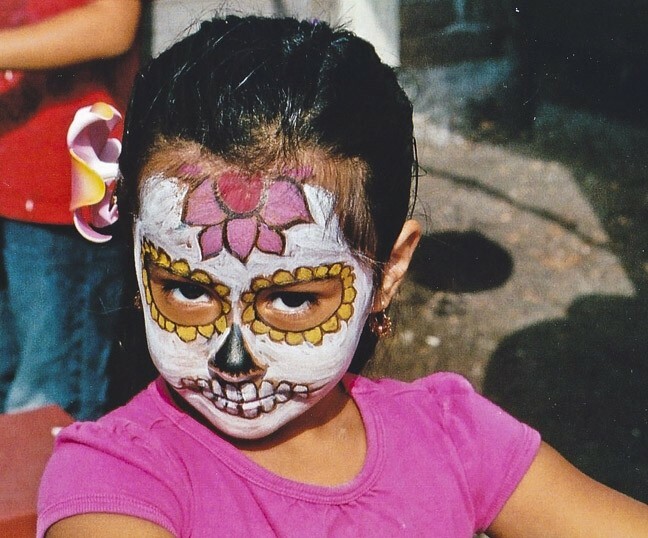 GENERATIONS OF FUN: Dia de los Muertos celebrations like the one happening at the Dana Adobe in Nipomo include family-friendly activities like face painting, arts and crafts, and candy making. Bereavement managers like Pires work with the dying—and those they left behind to grieve—on a daily basis. Avoiding the topic or the feelings it generates doesn’t help matters, Pires explained, and the Day of the Dead offers a chance for death to move into a more positive realm. Wilshire Hospice’s event will be bright, loud, and festive, including Aztec dancers, live mariachi music, art, poetry, face painting, family activities, and food. This is common of most Dia de los Muertos events, which are spread across one or two days. Santa Maria is also playing host to a Day of the Dead event at the city’s Veterans’ Memorial Hall. Though the hall is quite large, there’s only enough room to contain some of the altars that will be created for the event, with more spilling out into the plaza, and even more festivities happening in Veterans’ Memorial Park across the street. IF YOU BUILD IT, THEY WILL COME: he Mexican-American Scholarship Cultural and Recreation Association holds a Dia de los Muertos exhibition at the Santa Maria Town Center, which includes the vibrant altars built to memorialize the departed. 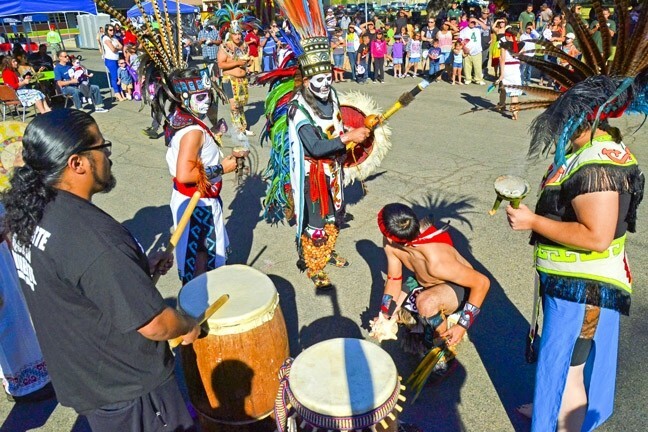 The Santa Maria event will also include a variety of music, Aztec dance, food, and family-friendly activities. Just across the Santa Maria River, at the Historic Dana Adobe in Nipomo, organizers are planning yet another Dia de los Muertos celebration, this one set to include several altars inside the Dana Adobe and a celebration outside with food, dance, arts activities, and music. Dia de los Muertos (or its Catholic equivalents of All Saints Day and All Souls Day) may very well have been celebrated at the Dana Adobe during the mid 1800s by Capt. William Dana and his family. The adobe was a religious household—and was no stranger to death, explained Dana Adobe Nipomo Amigos Executive Director Marina Washburn. To that end, many of the community events planned for this year feature activities for children, including creating altar items, decorating sugar skulls, and face painting. Participating in a Dia de los Muertos event, at which the dead are remembered positively, may help young people grieve in a healthy way and feel a positive connection to a departed grandparent or other family member, Washburn explained. CENTURIES OF CELEBRATION: The city of Santa Maria’s Dia de los Muertos event will include a performance by Aztec dancers. The celebration is said to have originated with the indigenous Aztecs. The Day of the Dead appears to help people of all ages process a difficult topic. Building an altar may be a daunting task at first, but when it’s finished, it can bring a sense of connection between the person building the ofrenda and the person to whom it’s dedicated. To continue the remembrance with large, boisterous activities reminds celebrants of good times spent with loved ones who are gone, but also shows that the party will continue even after we all take our respective bows. Joe Payne is arts editor of the Sun, New Times’ sister paper to the south. Send comments to jpayne@santamariasun.com.